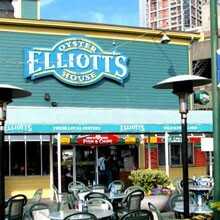 You can eat oysters on the half shell all year long, and Elliott’s shipshape, brass-railing bar (and lovely Sound-side outdoor deck during summertime) is just the place to do it. The oysters are super-fresh (they sell a ton of them), the shucking is ultra-professional, and the wines (or, of course, martinis) are specially selected to go with them. If you’re feeling poor, Elliott’s oyster happy hour is excellent (and if you’ve never eaten a raw oyster, your first one is on them—honor system). The rest of the menu features high-quality, good-if-unexciting seafood favorites. Cafe 56 (formerly Elliot’s Seafood Cafe), the more casual part of the premises, has a sidewalk oyster bar and is good for a summertime shrimp salad, made with a big wedge of cold iceberg, crunchy hazelnuts, and lots of Oregon blue cheese dressing. Happy Hour Mon-Fri 3-5 pm ($4–$5 beer and house wine, $6 drink specials, $1.50–$3.50 oysters, $3–$4 food specials).